Tell us a bit about Maze & Vale and the concept behind it. 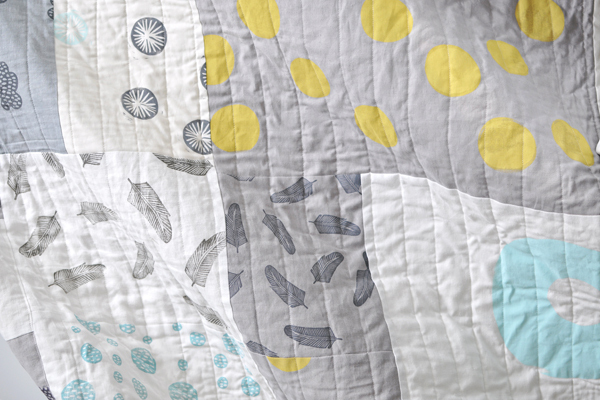 Small runs of handprinted muted tones and dramatic shades on natural textiles, improvisational and beautifully organic quilting, soft toys that are as cuddly as they are unique, homewares that are both functional and charming, all original designs, handprinted and handmade in Melbourne. That is what Maze & Vale is all about. I studied Graphic Design and Illustration and worked as a graphic designer, mostly in advertising, for 10 years. I always had a side project though, something to fulfill the creativity that professional graphic design work mostly smothers. Under the name of onegirl designwrks, I made hand-bound leather journals, sketchbooks and photo albums for six years, selling them online and in over 45 lovely shops across Canada. 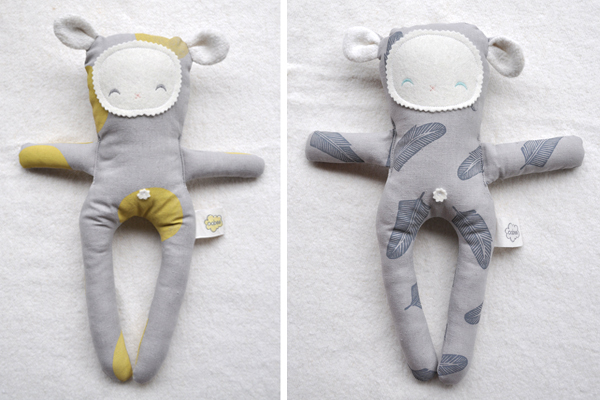 It was great experience, especially learning the wholesale side of things, but when I moved to Australia, I was ready for a change and I began designing soft toys and quilts. Another six years and two baby girls later, I decided to combine my love for cloth, sewing, colour and design by producing my own fabric to sell and create goods with. 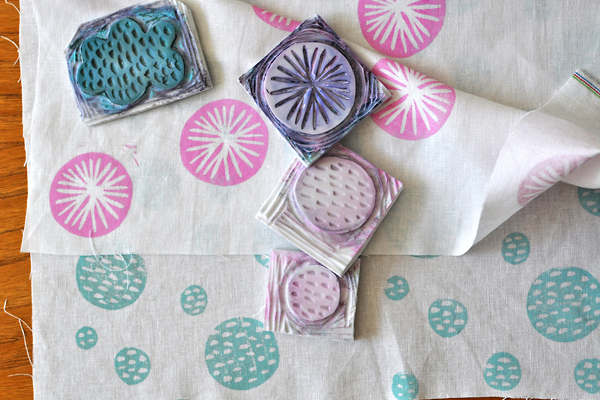 I started carving stamps by hand to print onto fabric (something I still do when working on new designs) and then moved on to screen printing as a way to cover larger areas. 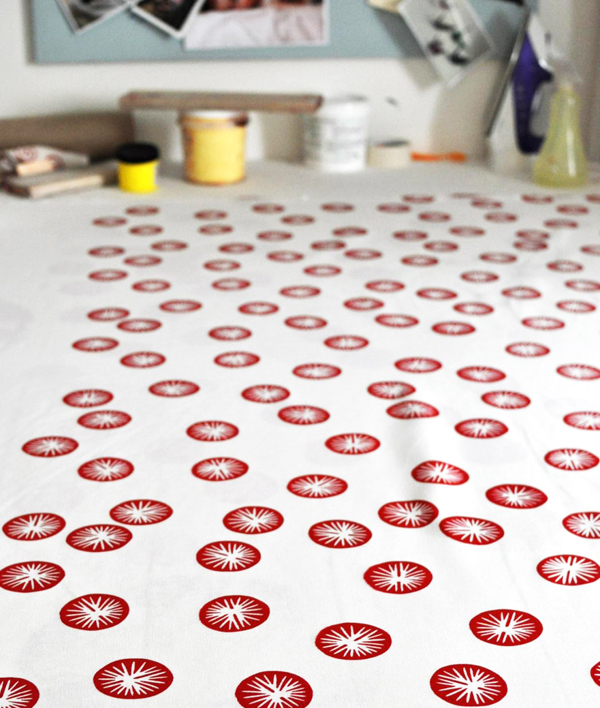 My amazing friends at Ink & Spindle have been both a huge inspiration and a completely invaluable resource, sharing their advice, knowledge of printing and working with textiles as a business, even giving me litres and litres of left over ink! 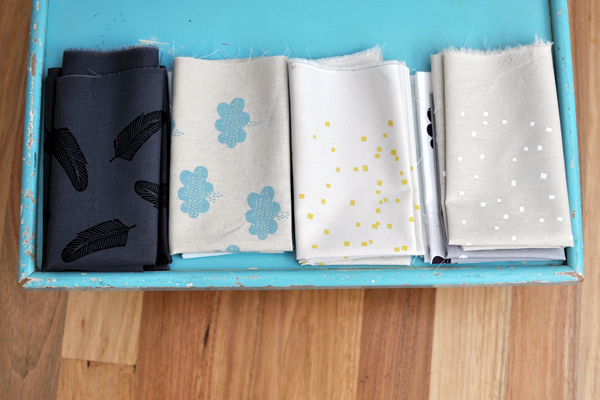 What do you love about working with textiles and designing your own prints? 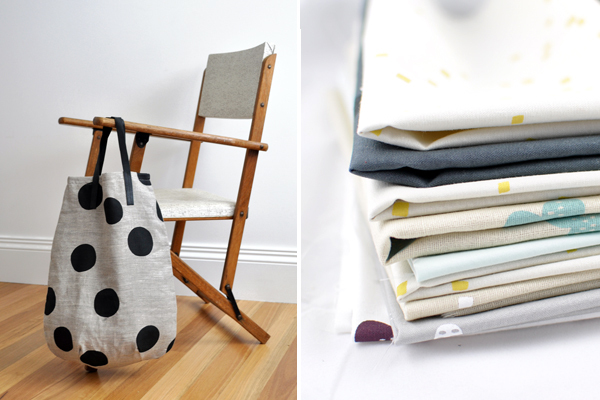 I’ve always loved fabric and been drawn to the tactile properties of natural cloth, especially cotton and linen. Working with and collecting prints as a quilter was a bit of an addiction but eventually I got to the point where I wanted more control over the designs and colours in my work. Using my own fabric to create things with now is exhilarating and being able to design and print something specifically for a project opens up so many doors creatively. When you are not working, what else are you doing in Melbourne? When I am not working I am hanging out with my two girls, doing mum-type stuff – playgroup, visits to the Zoos, Scienceworks, playground and the beach, walks in the park. I especially love when we visit the Royal Botanical Gardens, the Children’s Garden is fabulous and I never fail to be inspired by the shapes and forms of the huge array of plant life. What is the hardest part about working for yourself, and what do you love most? The hardest part is finding the time to actually work. With two kids under four, my Maze & Vale work hours are basically a couple of hours in the evening (when they actually go to bed on time) and all day Thursday when they attend childcare. I’m pretty organised and manage to get a lot done in the hours I have but I always seem to have about 20 things I could be doing at each moment of the day. And that sort of explains what I love most about working for myself, too – the fact that I can work such erratic hours around my children’s ever changing schedule and can pop into my wee studio at home whenever I manage a bit of time. What plans do you have coming up for Maze & Vale? Since Maze & Vale is still quite new, I have oh-so many plans floating around in my head. I’m currently working on releasing a range of diy kits using my printed fabric and patterns and then I will focus on pattern development for all of the wonderful things I have scribbled out in my sketchbook – all the while fulfilling my need for new colour combinations and printing fabric for my etsy shop and markets like Finders Keepers! It is going to be a busy and wonderful year, I think.